Halogenoalkanes are compounds in which one or more hydrogen atoms in an alkane have been replaced by halogen atoms (fluorine, chlorine, bromine or iodine). They are also named haloalkanes or alkyl halides. They can be divided into primary, secondary and tertiary halogenoalkanes based on the number of substitutions of C which carries the halogen. 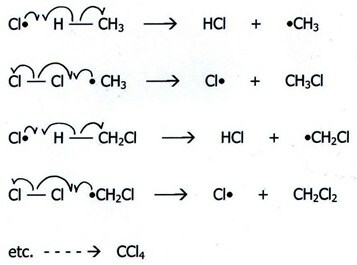 Substitution reaction can be electrophilic, nucleophilic or radical reaction. Halogenoalkanes (also called haloalkanes) are organic molecules that contain at least one halogen atom directly attached to the carbon skeleton. In a primary (1°) halogenoalkane, the carbon which carries the halogen atom is only attached to one other alkyl group. In a secondary (2°) halogenoalkane, as the name may suggest, the carbon with the halogen attached is joined directly to two other alkyl groups, which may be the same or different. In a tertiary (3°) halogenoalkane, the carbon atom holding the halogen is attached directly to three alkyl groups, which may be any combination of same or different. Fig1. Example of a secondary, primary and tertiary bromo-alkanes. Another way to say this is the following: when a carbon is bonded to one other carbon, it is termed "primary" and any halogens attached to it are also termed primary. If the carbon has 2 of its bonding sites bonded to carbons, it is termed secondary, and if a halogen is attached to one of the remaining 2 sites, it is termed a secondary haloalkane. These type of attractions get stronger and stronger as the molecules get longer and consequently have more electrons. This is the main reason why the boiling points increase as the number of carbon atoms in the chains increases, and consequently, it takes more energy to overcome them, and so the boiling points rise. As there is an increase in number of electrons from a chloride to a bromide to a iodide (for a set number of carbons), we can see an increase of the dispersion forces and therefore an increase in boiling point. For instance, iodomethane will have a higher boiling point than chloromethane. The carbon-halogen bonds are polar, because the electron pair is pulled closer to the halogen atom than the carbon. This is because the halogens are more electronegative than carbon. Iodine is the exception in all this, as it has the same electronegativity of carbon, therefore the bond C-I is not polar. From the data above, we can notice that bond strength falls as you go from C-F to C-I, and notice how much stronger the carbon-fluorine bond is than the rest. The carbon-halogen bond, or the C-X bond, has got to be broken in order for anything to react with the halogenoalkanes. Because that gets easier as we go from fluoride to chloride to bromide to iodide, the compounds get more reactive in that order. Therefore, we can conclude that Iodoalkanes are the most reactive and fluoroalkanes are the least. -the C-X bond breaking to give positive and negative ions. The C+ then reacts with something either fully or slightly negatively charged. - an anion or a cation attracted to the slightly positive or negative carbon atom and pushing off the halogen atom. The strength of the bonds which have to be broken governs the reactivity of this compound. If is difficult to break a carbon-fluorine bond, but easy to break a carbon-iodine one. 1- nucleophilic substitution: the substituent is electron-rich and provides the electron pair for bonding with the substrate. Examples of nucleophilic reagents are the halogen anions (Cl-, Br-, I-), ammonia (NH3), the OH- , the alkoxy group (RO−), the cyano group and so on. Nucleophilic substitution proceeds via 2 different mechanisms, depending on whether the haloalkane is primary or tertiary. The mechanism followed by secondary haloalkanes is thought to be a mixture of the other two. 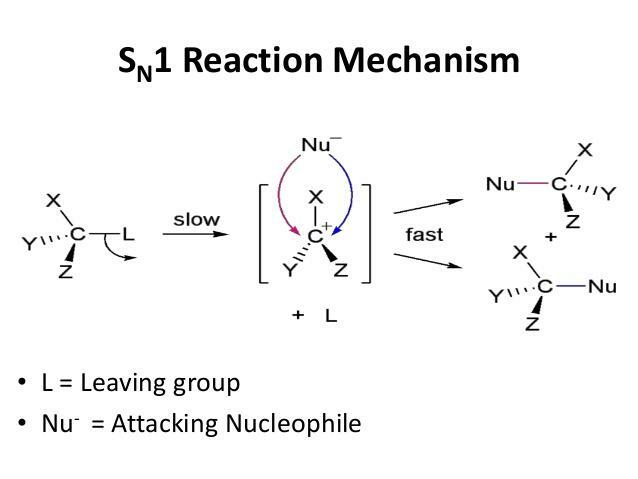 As shown in the scheme above, the nucleophile, OH- in our case. attacks the partially positive carbon that is attached to the halogen atom. This goes through a temporary high energy transition state in which the carbon atom is associated with the incoming nucleophile as well as the outgoing halide ion. 2- electrophilic substitution: the substituent is deficient in electrons, and the electron pair for bonding with the substrate comes from the substrate itself. Examples of electrophilic species are the hydrogen halides (HCl, HBr, HI), the nitronium ion (NO2+), and sulfur trioxide (SO3). 3- radical substitution: Involve the reactions of free radicals with suitable substrates. Examples of radical reagents are the halogen radicals and oxygen-containing species derived from peroxy compounds. Scheme3 example of a free radical substitution reaction.